Something happened to me on the weekend. Something so shocking that I'm still struggling to come to terms with it. It's never happened before. Well ok, I lie, it did happen once before, but it was while I was pregnant, so it doesn't count, it's a normal thing to happen while pregnant. This sort of thing is not supposed to happen to me. It's not. It's not in my genes, not in my nature, not in my life's plan. But here I am, sitting at my coffee table Tuesday morning, and all I can think about is what happened. And what I'm going to do next. You see, this weekend...I spring cleaned. And I liked it! I can hear your gasps of horror now, believe me I don't know how this happened either. Who am I? I thought after 30 years on this planet I knew myself, and yet, here I am trying to decide what to clean next. And I'm looking forward to it. 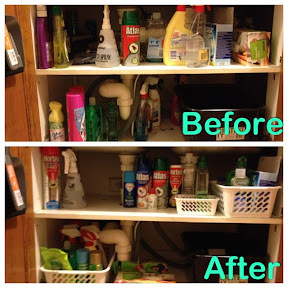 This weekend I chose to clean over blog or shop. To be honest, I did do a little bit of shopping. But it was purely to further this cleaning affliction that has a hold of me. It's not something that I was prepared for at this stage of my life. I have a husband, and a daughter, I keep my house clean enough to live in, clean enough that we won't all pick up some gross disease, but this, this is something else all together. It's scaring me. I mean, what's next? Cleaning the outside off my house? Cleaning every day? I don't know if I could handle that, I'd be torn apart by the warring forces of laziness and satisfaction. Cleaning is like a cancer to laziness, and if I'm not careful it will take over my entire being, body and soul. My husband says I shouldn't fight it. That perhaps this was my destiny all along. I'm not buying it. I'm pretty sure these cleaning days are numbered. In fact they literally are numbered. I blame The Organised Housewife and her ridiculously enticing brand of cleaning crack. Tasks so easy, and so well planned out, that even someone with a cleaning aversion as strong as mine can be sucked in. I don't know what I am going to do once I've completed all the tasks. Like a true addict I said I was only going to do it on the weekends. And then I spent all day yesterday doing it. That's how addiction starts. I have a problem. I've been cleaning. And I like it. It scares me. Pease tell me I'm not alone. 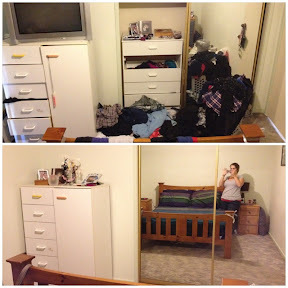 Love before and after shots like that. Maybe that is why I haven't started - I'm scared I won't stop and maybe I will even try to attack the garage and that would mean a divorce because I would be happy to get a skip and just toss everything and A would be very upset if I did that - so much so he might even leave me - or ask me to leave !!!!! Best I leave things as they are for now !!! Have a great time finishing the challenge. That is AWEsome Kylez, AWEsome! I'm, in love. 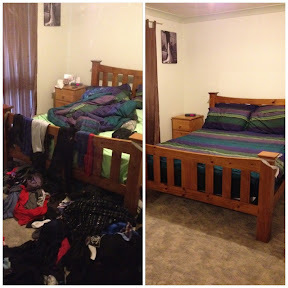 Welcome to my world, it is such a clean and happy place lol. Well done! WHOA MUMMMMMA!!! That is one amazing transformation!!! I am just like you.. living with enough cleaning so we dont get sick... which is how i found out I am a hoarder... eeeep!! I have printed out the tasks.. but yet to take it on.. my kitchen will take all week!!! 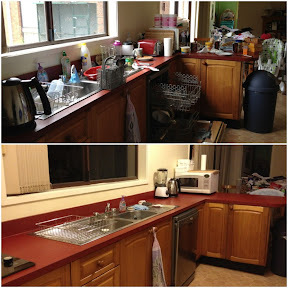 My kitchen did take forever, actually so did the bedroom for that matter. At the rate I'm going I'm not gonna be finished before Christmas! It's the season. Spring fever. It feels GOOD. Now go and have a lie down. No, I have been trying to fight the cleaning genes but I guess it's true what they say, you always turn in to your Mum! NICE!! Now could you come over and sort our place please???? I really should go and DO the organised housewife's little tasks but I fear no one would recognise our house and the children would disown me. when we got together hubby and I made a deal - I cook, he cleans. Somehow though, the important jobs like cleaning the fridge and organising the cupboards always fall to me (and I like it that way) the sense of satisfaction from having everything in a place is awesome... as long as I don't need to bother with all that pesky hoovering and crap. Well done, Kylie!!! I so need to get cracking on the spring cleaning. You have inspired me!